← When is 55 degrees at 10pm, what do you do? Normally I would paste part of the article but I’ll let you go to it if you are so inclined. I didn’t post this to make a statement or encourage mobile herb gardens. I mean people steal lights that don’t work off my bike so I’m pretty sure they make off with my basil if given the chance. I post this to add a bit of levity to your day if you are stuck inside while the weather turns SO NICE and all you can do is watch if from the window of your office, enjoy it for 30 seconds as you walk to your car, watch it from your car and try to enjoy it (with the required Fresh Prince Anthem bumping and all the windows down) then call it a day just in time to update your status and tweet about how much you “love this weather”. 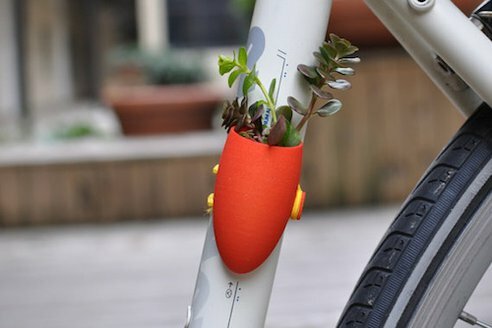 Mini Bike Planters Let You Take Your Garden With You : TreeHugger. This entry was posted in Bike commute, Car Free, Urban Bike and tagged Bike-Friendly, Car-free movement, CarFree, CarFree Movement, CarFreeBrad, CarFreeBrad.com, Facebook, Gardens, Home and Garden, TreeHugger. Bookmark the permalink.